Happy 4th of July! Hope everyone has a lovely week and stays cool out there! * Be sure to enjoy the raspberries right away. They won't hold long with this heat!! 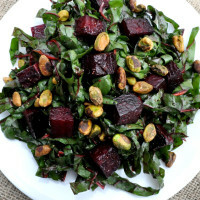 Here is a great, healthy and simple recipe using your swiss chard and beets!